Salted egg, known as itlog na maalat, is a common fixture on every Filipino table. In tropical countries like the Philippines, this is one way to preserve eggs. 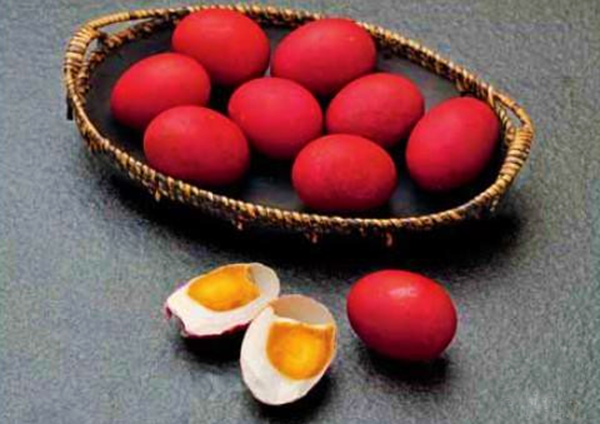 Salted eggs are often dyed a deep red to distinguish them from fresh eggs. Filipinos love to combine chopped salted eggs with tomatoes or have them with Fried Marinated Fish. Salted eggs are also used to garnish pastries and as a topping or filler for steamed buns (siopao). Because of their bigger, richer yolks and thicker shells, duck eggs are traditionally used but chicken eggs work fine too. To make salted eggs, eggs are soaked for about three weeks or more in a brine solution and keep them in a dark and dry place— preferably your cupboard. The eggs do not cure as quickly at cooler temperatures and the length of the curing period depends on the temperature. In the Philippines, the eggs cure after three weeks— but may take longer if you live in a cooler climate. 1. Place the eggs in a wide-mouthed jar with a lid. 2. Add the water to a saucepan and bring to a boil. Add the salt gradually. Stir until the salt is totally dissolved. Set aside to cool. 3. Pour the cooled saltwater over the eggs. The eggs should be completely submerged. Add more of the brine solution if needed. 4. Cover and store the jar in a dark place for at least 3 weeks. To test the egg’s saltiness, take out one egg after 3 weeks, and boil it over high heat for 30 minutes. Let cool for a few minutes. Peel the shell and taste. If the saltiness is to your liking, take out the other eggs, boil, and store in the refrigerator. If you want a “saltier” salted egg, leave the eggs for another 2 weeks.